Ivy Cottage is situated within walking distance of Crieff town centre and all amenities. The nearest pub serving food is just a 10 minute walk for those not wishing to drive, or for those who wish to relax, sit in the conservatory and bird watch (feeder and wild bird seed provided) or the garden in the summer. Crieff is an ideal touring base for the whole of Perthshire (Perth only 20 minutes drive, with good public transport). Glasgow / Stirling / Edinburgh all within easy reach. Full of character and charm, this south facing, traditional / vintage one bed cottage is set within its own enclosed walls, with large private parking area / garden / outdoor table / chairs and barbecue. With a gas combination boiler serving endless hot water and double glazed throughout, it is a cozy, welcoming place to stay. Well equipped and personally supervised by the owner, an ideal cottage for couples who would like to explore the surrounding area. We lived there for many years, so it is not an unloved cottage, I love it if I have time before my visitors arrive, to just sit in the garden and have a cup of tea and admire the garden, which I have put a lot of work in to. Crieff is great there are so many things to see in the surrounding area, there is a country cottage feel, but yet you are minutes from the town centre. Access to Edinburgh and Glasgow are also within easy reach with good links to public transport, so you never feel remote while staying at Ivy Cottage. Just the chill-out feel, and the magic of Ivy Cottage does the rest. Downstairs bathroom with bath, overhead shower, WC and wash hand basin, and additional underfloor heating. Adjoining the bedroom is a small WC with handbasin. Diner/sitting room, with range type cooker (gas/electric), comfy sofa, electric woodburner stove, 30 inch TV with freeview and integrated DVD player, iPod station. Large range cooker (leisure master) Gas hob, electric griddle, electric hot plate and grill. Double electric ovens. One fan .. One conventional. Crieff 2 miles: 18 Hole Course; 9 Hole Course - parkland. Comrie 6 miles: attractive 9 Hole Course - tree-lined. St. Fillans 12 miles: attractive 9 Hole Course - mountain scenery. Gleneagles 10 miles: famous Championship Courses. Notes on accommodation: Pets are very welcome but there is a small charge of £15 per pet. Registered assistance dogs are free of charge. Baby equipment provided: cot (not bedding), high chair, car seat, pushchair and potty! There are maps, guides and leaflets which will help you enjoy your holiday. Outside: There is a small barbecue, outside table and chairs, I have planted over the years a tiny orchard that has apples, plums, damsons, blackcurrants, please help yourself. Utility Room: Utility room gas boiler, washing machine,dishwasher, large fridge/ freezer, microwave,iron and breadmaker. Cleaning materials are provided. Coffee, tea, sugar, salt, pepper, cling film, tin foil, wash powder, conditioner, soap and toilet paper provided. Cleaning / Towels / Linen / Maid service: All linen, towels, tea towels are all provided for you, if a fortnight booking,replacement linen and towels are provided. 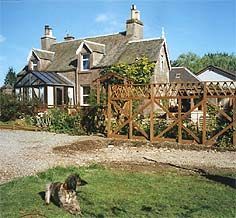 We spent a very pleasant week in charming Ivy Cottage and would recommend it to anyone who is planning on visiting Crieff. Ivy cottage is quaint,quirky and cosy. We had a lovely relaxing break in Crieff. The cottage was quirky and lovely especially the garden. The bed we slept in was especially comfy. Jane was there to meet us and show us around, a lovely host. We have absolutely fell in love with this vintage cottage. Everything we needed can be found here. The cottage is beautifully decorated inside out. The conservatory has radiators to keep you warm. It has a sizable garden featuring generous parking space. Close to shops, town centre as well as walking trails and parks. A lovely place to relax and enjoy our short break. Owner Jane has been extremely friendly, caring and helpful. This is a great place for outdoor activities. one of the worst nights of my life. So cold. The property was very hard to find. Access dangerous. On arrival the outside sensor light didn’t work. No bulb in it. The porch was poorly lit. Had to. Use a torch to see the key code. So cold. Owner said the temperature was set at 18 degrees. One room to live in. With to much in it. Didn’t ring owner straight away as she told me. Her husband wasn’t well. Didn’t want to bother her. Luckily the padlock on boiler was unlocked. So reset heating. Could not get warm. Radiators cold,. You could hold your hand on them with out burning your hand. Emailed owner. No reply. Open the door to upstairs toilet and it hits the basin.Also no hot tap in there it’s a water heater. Rooms in property locked. Labels saying don’t use this bed or fire. Gave up trying to get warm.So we went to bed. The bed felt wet it was so cold. I slept in my clothes. In the morning my wife was taken very sick from the cold. So we decided to leave. Owner did ring offered extra oil filled radiators. Didn’t realise they still did them. See also wanted to meet later that day. What was the point. Very dated property. I was so disappointed. We loaded the car and left. I told owner we where not prepared to stay. We went to a hotel as it was one we had used before. We knew we would have heat and comfortable living.Numerous emails later. Trying to get my money back. She has offered me.A very minimal refund. As of this moment have received nothing. Keeps telling me it would be her loss if she did. She won’t even email me at all. Says she will only answer to home and away.All my money has gone down the drain for one night in a cottage that’s in need of serious update. Wall paper on the ceilings really. Lights on timers. Seriously. Standard lamps and table lamps in this day and age. Really. Seeing as your keeping my money. Suggest you update the cottage wiring and sort heating. Also suggest redecorate.Have lots of pictures if you want them. I asked for a refund the day after. We arrived. Ten days later she offered me a refund about one days . Disgusting. At least it didn’t ruin my birthday. Which we planned to enjoy in crief. Or seeing my best mate that lives in comrie. 600 mile trip to stay in a cold dark Very dated cottage. I would like to point out that the access is safe, the cottage is dry and warm and guests have access to the boiler. All my safety certificates are current My commutation i consider excellent. This is why I have premier host status. I feel my website is clear with clear images. This guest had that opportunity. If you are a late arrival and I am not there to meet you there are 2 lights on timers. The outside sensor light. Yes I did find out it was not working. Today it was replaced. It saddens me to have received this, and saddens me to have reply in this manner. The owner was very welcoming and the cottage was comfortable and well located for our intended excursions. Great location for visiting Perthshire and good places to eat in Crieff. Well equipped, querky quaint and cosy. A lovely garden to relax in. The conservatory is a bonus for evenings sipping wine and meals. Jane is very helpful and accommodating. Thank you both so much for choosing Ivy cottage. You had without doubt wonderful weather Also thanks for your kind words about the cottage and myself. I really enjoy meeting my guests. Also thanks for the present you left and for leaving the cottage so clean and tidy. Please come back ! Hill/Low Walking: excellent scenic routes for all ages surrounding the local area. Excellent local golf,and whisky tasting at Glenturret Distillery! Crieff is the main town in Strathearn, lying on the Southern edge of the Scottish Highlands. It has been a holiday resort since Victorian times being a former spa town, and is the second largest town in Perthshire with a population of almost six thousand; it is an ideal touring base for the whole of Perthshire, or to venture to the east or west on days out, and yet the town spills into many easy accessible woodland walks (at high and low level). Ivy Cottage is situated within walking distance of Crieff town centre and all its amentities. It is a great location for a Scottish holiday. The nearest pub serving food is just a 10 minute walk away. Perth, Aberfeldy, Dunkeld and Pitlochry are all within easy reach by car. Edinburgh, Stirling , Glasgow, Dundee, St Andrews are only about an hour away. There are castles, historic churches and gardens all close by, there is so much to see and do in the area you are spoilt for choice! Loch and river fishing, walking (at high and low level) and local attractions including the oldest Distillery in Scotland (Glenturret), excellent golf courses close by, Crieff has been a popular holiday resort since Victorian days - now with a good choice of many restaurants to suit all tastes; the Strathearn valley lies an hour from Scotland's main cities. Booking Notes: Once we receive your booking request, we will email you to confirm the booking and to request payment of a non-returnable 25% deposit, or full payment if the booking is less than 4 weeks ahead. Changeover Day: Normally it is Saturday, as in the busy summer month we only accept weekly bookings, if you are on a short break we are of course flexible. please send me a email re dates you are interested in. Thanks jane Notes on prices: Prices include gas/electricity, heating, hot water, all linen, towels and tea towels etc.